Finally, I really think that the protocol would work for us, and serve our needs in a reasonably economical manner. The INTERNET protocol permits us to adopt TCP or some other set of end-to-end protocols in the next higher layer of the network. It allows us to use HDLC as the link level and local area network mechanisms for delivering packets to the end-user' stations. It's compatible with what we need for the satellite net. It has some really neat features, and I would like to see some comments on why we shouldn't use it. In looking over this document the application of the standard is fairly straightforward except for one area, and that concerns addressing. A four byte source or destination address is specified, and that does not meet our needs. The first byte of this four byte field represents a network, and about 40 of the possible 256 combinations are already assigned. I attempted to contact the author of the document to see if a number could be assigned to an amateur radio experimental network, or to see if there already was a number for personal computing networks, but John Postel was out of town, and I didn't get an answer to my question. It seems clear that 256 networks is somewhat limiting, and that some future revision of the standard will have to expand this field. In the meantime, we should assume that this field is reserved and not to be used by us, and if we don't get our own network number, we can set the field to zero. Addresses only have to be assigned to stations serving as network traffic processors, such as repeaters, gateways and mailboxes, and other individual stations do not have to have an address if they are accessible via a local net served by such a gateway or repeater. 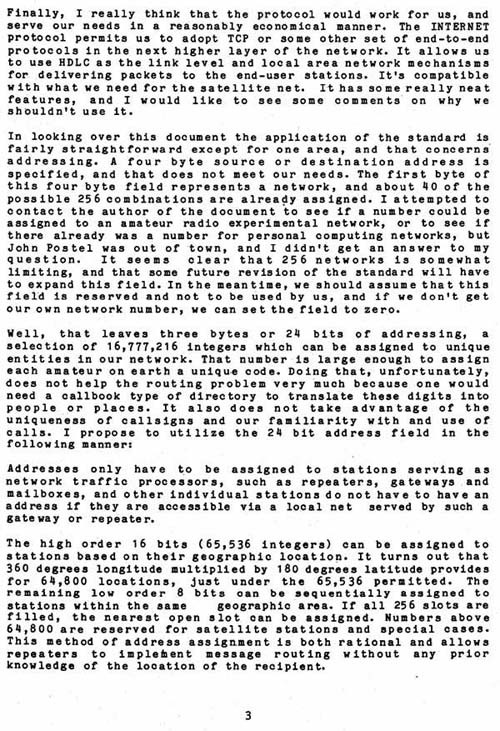 The high order 16 bits (65,536 integers) can be assigned to stations based on their geographic location. It turns out that 360 degrees longitude multiplied by 180 degrees latitude provides for 64,800 locations, just under the 65,536 permitted. The remaining low order 8 bits can be sequentially assigned to stations within the same geographic area. If all 256 slots are filled, the nearest open slot can be assigned. Numbers above 64,800 are reserved for satellite stations and special cases. This method of address assign.ment is both rational and allows repeaters to implement message routing without any prior knowledge of the location of the recipient.